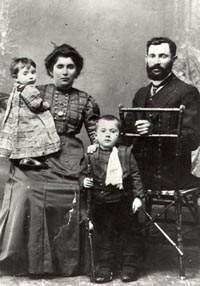 Isadore (Itzak) Babusky and his parents Avrum & Ruchel Babusky immigrated to the U.S. in 1912. They changed the family name to Bell and lived in Philadelphia, Pensylvania. Other members of the family settled in Wilmington, Delaware. Sophie (Shifra) Weingranovitz and her parents Nathan (Nutte) & Elke Weingranovitz immigrated to the U.S. in 1914. They changed the family name to Weiner and lived in Philadelphia, Prennsylvania. Other members of the family settled in NYC, NY. My ancestors lived in Zvenigorodka, Ukraine, Cherkassy Oblast. The only relative living in that city in 1941, when the Nazis arrived, was my mother's brother Yaacov Aaron Belogalov, with his wife, children and grandchildren. I searched everywhere and can find no trace of them, so I assume that they were rounded up by the local Ukrainians, taken to the forest, shot with one bullet each and thrown into the pits. I was hoping that maybe my male cousins or their children survived in the army. My mother also had a sister Toba Leya Belogalov, who married a hatmaker, (family name Machler). 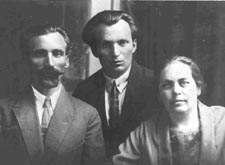 They were sent to Birobdjhan during the early 1930's with their two young sons, aged eleven and fifteen (I'm guessing). No trace of them either. At the turn of the nineteenth century, my mother's two cousins, family name Kutzko, immigrated to Argentina, or were sent their by the Baron de Hirsch organization. They and their families visited New York years later. We corresponded with them for a while and then they disappeared. My paternal great grandfather was supposedly from Cherkassy. He was Isaac Cohen and came to the US through Canada (Regina) around 1920. According to some of the handwritten documents, a cousin's "Family Tree" and another cousin's handwritten documents, it was my great grandmother who was from "Cherkas". Her name was Bessie Lomawatsky and she married Isaak Cohen. 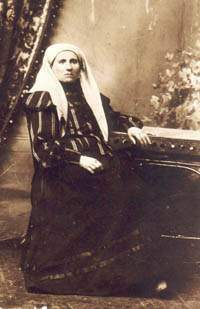 Her parents were Mayer Lomawatsky and Mina Bogasausky. Bessie and Isaak emigrated to Canada and eventually found their way to Philadelphia, PA. Isaak Cohen's parents were Israel J. Cohen and Tisha Uswath. I feel that my roots are from Cherkassy. My father Yehuda (born Chekassy @1907-died Israel@1887) was (the son of Shmuel-Yona Cohen [died 1917], a Hebrew teacher). He, a few of his siblings and a few of his cousins were born in Cherkassy. He and his wife Chia (nee Kitgorosky) lived in Cherkassy. He was a Hebrew teacher. The family was very Zionistic. He studied in a Volozin Yeshiva when he was young; but was also a very enlightened person. Myfahter's grandfather was Hanoch Cohen. He was born in Cherson; but lived in Cherkassy. The family left Cherkassy when he was a young boy. The entire family, including the Kitgorosky brothers, seems to have gone from place to place together. They went to Galicia (Tarnipol, Lvov). They were there during WW1; but were exiled to Hungary for they had come from an alien country. After the War they returned sick to Lvov. Yehuda came on Aliya to Israel in 1922. The Kitgorosky brothers taught in a Yeshiva in Drobi. My father's cousin Joseph Katai, who wrote for the Zofeh (Israeli newspaper) told us some stories about the family background and their life in Cherkassy. There was a Chassidic Rebbe of the Twersky Dynasty that lived there, one of the eight sons of Rebbe Mordechai of Chernobyl who was the son-in-law of the second Lubavitcher Rebbe. A monument was erected over his grave through the efforts of Rabbi Meir Yisroel Gabai, who is engaged in the identification and perpetuation of the memory of Tzadikim in various parts of both Western and Eastern Europe. Today Cherkassy has become a pilgrimage destination for many tourists who come to Ukraine to visit the burial sites of the righteous and celebrated Jewish leaders throughout the history of this region. In my family tree, there are only two main families that I know of who came from the town or district of Cherkasy. My great-grandfather and my grandfather and his siblings appear with the surname of DWORECKI on their immigration manifest, and they apparently came from the town of Smila in the Cherkasy district. For some reason, the family changed their surname to PADEROVSKY after arrival in New York, and then used a variety of other surnames in the US. The reasons for this are not entirely clear. However, I believe that DWORECKI was the true surname in Russia. DWORECKI, was the name listed on the ship manifest. The other family in my tree is the CHODOSH family. They apparently came from Cherkasy, and they generally spelled their name CODISH in the US. My husband's maternal grandfather was Israel Gimpilewitz (Americanized to Ed Gimble). He came in the early 1900's and homesteaded near Velva, ND. 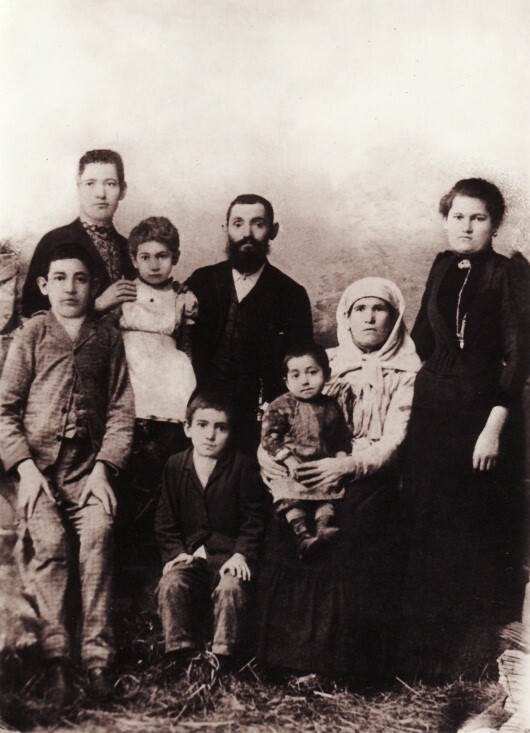 His wife Marione (Mary) and children, Hansel (Howard), Jonse (John), Dobrie (Doris), Rochil (Rose), Aisih (Ivan) came in 1907 on the SS Majestic White Star Line to join him. According to the ship manifest their place of residence was Zercaty, Russia. (Howard Margol & others are convinced that is Cherkassy.) The parentheses are the Americanized names. Last fall I went to Salt Lake City and with assistance found the birth record of my mother-in-law, Rose Gimble Marck, in the records for Cherkassy. Very exciting! They had a daughter Necha Reyentowitz who was married to Philip Golding. He was a struggling magid (teacher of Jewish subjects), a teacher and lecturer and a very religious man. He was a very strict person and pretty harsh to the children. Yiddish was the family language. The family lived in Cherkassy. It is quite possible that the family also lived previously in Cherkassy, Ukraine. Necha Reyentowitz died in about 1890, when my Grandmother was about 8 years old. When I asked her about her Mother, she told me about a Passover, which they wanted to celebrate in the traditional way; but were forced to do otherwise. They all had to stay in their house and be sure to be under the window level. The windows and/ or shutters (or whatever they had, had to be closed). I asked her if she couldn’t run outside to tell something to a girlfriend. She looked at me, as if to say that it was obvious that I could not understand, and said that it seemed impossible for her to cause me to understand what had happened. I asked what about their Sedarim. She said that what was important was to stay alive, that they lived through their own “Exodus from Egypt”. Therefore I think that this was evidently a pogrom, and was when her Mother was killed. The family immigrated to Manchester, England in about 1895. They brought their samovar, candlesticks, wine cups, and bedding with them from Cherkassy. 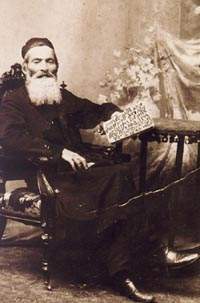 Julius- Jewish name- Judah (1878-1932). He married Annie Shimm in 1902. She was his mother's cousin. He came with the family to England, in about 1895. He stayed there for a short time- about a few years. Then he went to the USA at about the turn of the century. He married Annie Shimm in New York in 1902. He worked as a furrier. They lived in Far Rockaway, New York. They had 4 children. Sarah (1886-@1960) She came to England when she was about 15 years old. Therefore she did not have much or any schooling in England. She went to work. She did learn to speak English, but never actually learned to read or write English. She married Rubin Goldstone. They had a corner grocery store, in Manchester. They had 4 children. Janie: 1881-@1948) She was born in Cherkassy. She married Mr. Shorr and lived in England; but came to the USA together with her sister Lena. She was very sickly. Her husband evidently died in England. They did not have any children. She died about 1948. She was a very good friend of Annie Wintrob. Abey- (1893-1965) He was born in Cherkassy. Abe married Ginny Gustav. They had 2 children. Jack- (1899-1918) He was also born in Manchester, England. Jack Golding was an English soldier and was killed in battle. The British Jewry Book of Honour confirms his service number and date of death as well stating that he was in the 1st and 7th Battalions of the Manchester Regiment. His home address is listed as being 19 Sycamore Street. Apparently this was the address of his sister and brother- in-law: Edith (My Grandmother) and Zacharia Marcus. He died at Flanders on April 5, 1918. He is buried at Gommecourt Wood New Cemetery Foncquevillers. His death was also listed as a Jewish casuality. The family name was originally Goldin, but was changed by custom officials upon arrival in England. My grandmother reminisced about Anti-Semitism, Chassidim and sunflower seeds in Cherkassy. 'Peace be with you. Regards from the mishpocha; from your father who sends greetings to each seed, seed, seed ... and every one of the children. Pesach Yehudovich Gotlibovich, 17 Tishri 5666'.